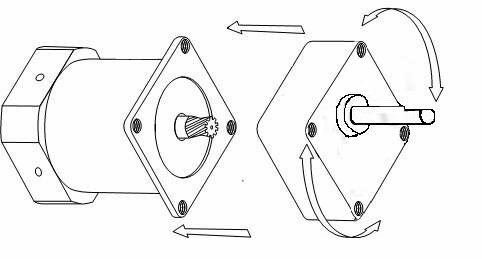 To assemble the motor and gearbox, adjust the assembling faces together as shown in the image below and turn the gearbox slowly to screw the gearbox into place and the complete the assembly. This should only be done by gentle feel and there should be no force used at ANY time. There may be a small sticker on the back of the gearbox (at the point the motor shaft enters) on the larger gearboxes, just peel this off. Take extreme care not to knock the motor output shaft against the internals of the gearbox. Because of the precision gearing this will damage either the shaft of the motor or the gearbox and will result in a noisy unit which ultimately will have a much shorter lifespan. If you are NOT comfortable doing this yourself, please advise us when you order and we will assemble it for you! If you assemble the unit and it will not turn, do NOT power it up! We shouldn't even have to say this, but believe us, it DOES happen! DO NOT ATTEMPT TO WIRE THESE YOURSELF. THEY ARE REQUIRED TO BE INSTALLED BY AN AUTHORIZED ELECTRICAL INSTALLER! This is one of those times, where no matter what you say, people will attempt to wire these up themselves. I die a little inside each time I hear questions like "do I really need the capacitor" or "shouldn't the Black wire go to Earth". Honestly these calls give me nightmares. 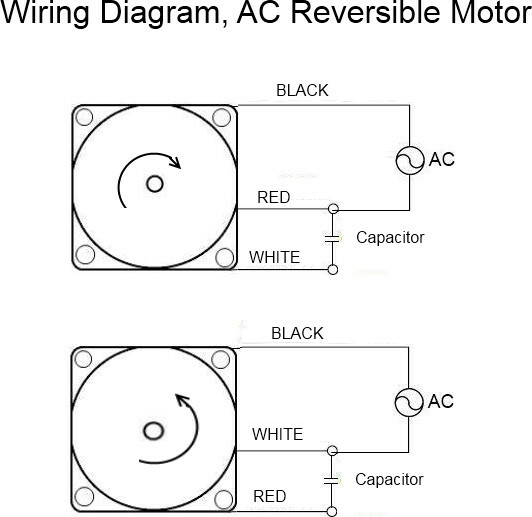 Be aware that ALL the AC motors we sell have no cords. You CANNOT just plug them in. These need to be installed by a certified professional, and we take NO responsibility for your failure to ignore these warnings. You die at your own risk. And if that doesn't put you off, how embarrassed are you going to be when the headlines read "Man fried while eating chicken" ? Ok, that's probably not going to happen, but really, bad wiring may cause death. 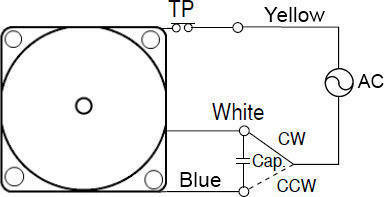 For professional people, the wiring for the motors is quite simple. 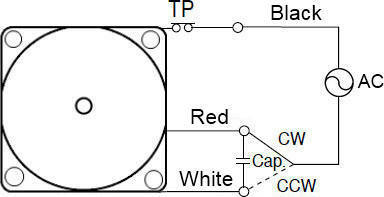 There are generally two types of connections used in these motors which is Induction or Reversible wiring. 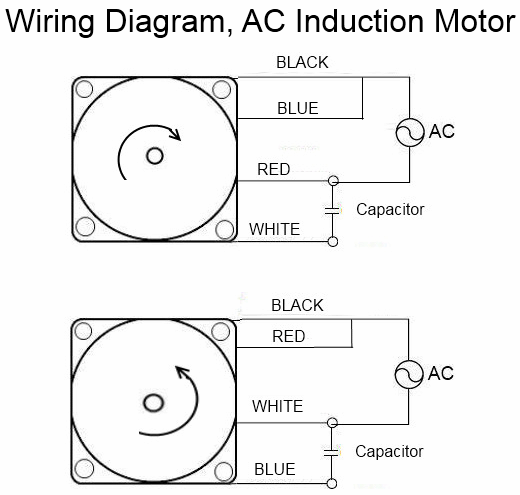 Reversible wiring is usually 3 wires whereas induction is 4. 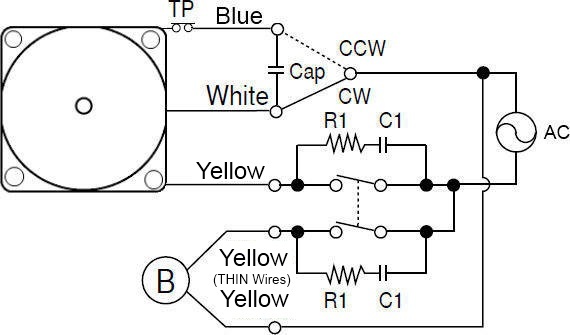 The advantage of the Reversible wiring (3 wires) is faster reversing times. The advantage of Induction is higher efficiency. The capacitor and resistor are there as a spark arrestor for your relay. Relay=inductive!